The son of former captain Ray Shaw, Rhyce joined the Magpies under the father-son rule at the 1999 National Draft after having played initially with Diamond Creek and the Preston Knights. Blessed with greater pace than his father, Shaw’s evasive and baulking skills suited the role of wingman. He was drafted despite a bout of chronic fatigue syndrome which cut into his time on the field in 1998 and 1999. Although the youngster had to wait until late in 2000 to make his AFL debut because of a broken collarbone sustained early in the year, he showed tremendous poise when he took the field. But after playing against Hawthorn in the first round of 2001, Shaw did not reappear again for another two years. 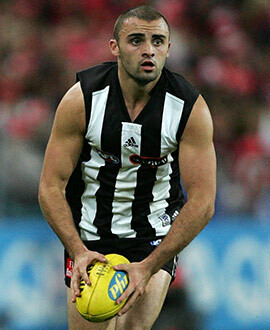 He bounced back for a fine 2003 season as a running defender, but had a quiet Grand Final against Brisbane. In the middle of the year he drew on the inspiration of the dying Bob Rose who had worn the No.22 guernsey with such distinction. Shaw’s father Ray recounted the story of how Bob Rose had talked him into continuing at Collingwood after the disappointment of the 1977 Grand Final loss. His 2004 season was a mixed bag as he started slowly and his uncle Tony Shaw was outspoken about the inordinate amount of time he spent on the bench. He showed some good form in the later stages of the year, but was still bandied about as a trade possibility. In the end he stayed, and it all started to click for him in the early part of 2005 when his run and anticipation made a difference until he injured a knee mid-season. He returned midway through 2006 and although he was handy, he was not back to the form of the previous year. He was offered as a trade for Brisbane’s Cameron Wood at the end of 2007, but stayed and performed well in patches, only to run into discipline problems late in 2008. Shaw was a late inclusion for the Elimination Final against Adelaide and performed well in a surprise victory and held his place for the Semi-Final loss to the Saints the following week. It marked the end of his time in Black and White. Shaw was traded to Sydney in exchange for selection No. 46 (Luke Rounds). He enjoyed a mighty first-up season to be runner-up in the best and fairest and continued to give the Swans great service as a running defender. Shaw was a key member of Sydney’s 2012 premiership side, but missed a large chunk of the 2013 season with a lower abdomen injury and soon after he returned from a long lay-off. Unfortunately, he ruptured an ACL in the penultimate round against Geelong at Kardinia Park and had to undergo a knee reconstruction.